Experience the enjoyment and self-satisfaction of a weekend spent lacing your own pair of quality Country Ways Snowshoes!!! Snowshoeing is for everyone – young or old, expert or beginner. Experience the beauty of nature and the wonder of wildlife as you travel through woods or fields on your snowshoes. Join us for relaxed, quiet enjoyment by the fire! Arrive 6pm on Friday and depart when you are finished lacing your snowshoes on Sunday. We provide you with a kit that includes ready-made frames and required lacing. You will finish varnishing the snowshoes on your own at home. Costs include: snowshoe kit ($180 value), 4 meals and snacks, hands-on instruction, and hotel-style lodging in the Adult Retreat Center. Registration Deadline: Friday, December 20, 2013. A GREAT CHRISTMAS PRESENT FOR SOMEONE WHO LOVES MAKING THINGS BY HAND AND LOVES WINTER OUTDOOR RECREATION OR WANTS TO TRY A NEW WINTER ACTIVITY!!! 3. 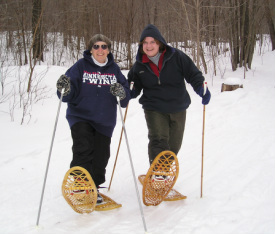 Pick out the style of Snowshoes you would like by visiting the Country Ways website "Picking Your Snowshoe Size". YOU WILL BE CONTACTED REGARDING WHAT STYLE AND SIZE OF SNOWSHOE KIT YOU WOULD LIKE TO ORDER ONCE WE HAVE RECEIVED YOUR REGISTRATION.